In this Nashbar Single Speed 29er review you’ll discover everything you need to know. You’ve made up your mind to buy a budget-friendly single speed mountain bike. You don’t want to pay more than $1,000, but you want something that is high-quality. But with so many bikes out there, it’s hard to settle on the right one. Sound familiar? You’ve done some searching on the internet. 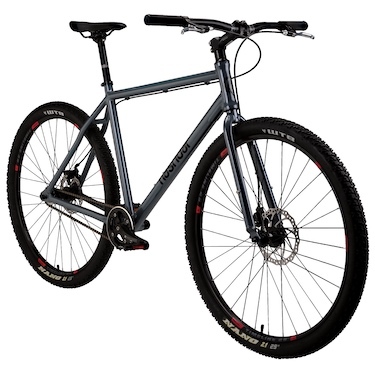 The Nashbar Single Speed 29er Mountain Bike seems like a good choice. It has a lot of the features that you want in a ride. But you’re still unsure if you should pop for it. We understand how important this decision is for you. That’s why we did a deep dive to get the facts. Our Nashbar Single Speed 29er review will tell you everything you need to know so that you can decide if it’s the right bike for you. If you’re in a hurry and just want to see the best price for Nashbar’s 29er SS, we got you covered! Click here to see the best price for the Nashbar Single Speed 29er. 1.2 What Is The Nashbar 29er Single Speed MTB? 1.11 Review Conclusion – Best Single Speed Mountain Bike? Before we dive into the details, let’s go over a few things you need to think about first. A good-quality mountain bike is a big investment no matter how you look at it. It’s essential to think about a few things before you drop the cash so that you get the right bike. Let’s walk through some things you need to know before you buy a single speed bike. Riding a single speed mountain bike lets you focus on the road instead of shifting gears. Another advantage is that there is less maintenance than a multi-gear—and fewer parts that can break. That means no worries about replacement parts. As a single speed, it adds a challenge to trail riding that you may find a lot of fun. If you have a limited budget, buying a single speed mountain bike makes sense because you can get a lot of bike without paying an over-the-top price. If you don’t want to mess with a lot of extra maintenance with derailleurs and other parts, you’ll like going the single speed route. A single speed mountain bike is a great choice for the casual rider who doesn’t do a lot of serious off-roading. But if you like rough trails with lots of hills, a single speed bike might not cut it. It’ll take some serious muscle power to climb up steep slopes. If you want to get in better shape quick, that’s probably a good thing. If not, then a multi-gear bike is likely to be a better fit for you. You’ll be able to shift down to those tiny gears to get up those hills faster and easier. What Is The Nashbar 29er Single Speed MTB? The Nashbar SS 29er may not have the flash of other bikes, but it’s a great option for the price. The Nashbar 29er Single Speed Mountain Bike doesn’t have the flash of well-known brands like Trek or Cannondale, but it’s a decent ride for the money. It’s a good option if you’re new to the sport or are a casual weekend warrior kind of biker. It has an aluminum frame that makes it lightweight and easy to handle which is plus in rugged conditions. It doesn’t have all the bells and whistle of a bike for technical rides, but it offers a lot of features that make it worth a look. The Diamondback Overdrive Comp 29er mountain bike, on the other hand, is a geared bike that is more suited to mountain biking than this one. Diamondback upped its game with Shimano Deore drivetrain and shifters and an upgraded 10-speed rear cassette while keeping it under $1,000. When you get down to the specs, you’ll see the differences pretty clear between the different price points. It’s not a bad thing when you consider the type of riding that you do. Knowing what to expect up front will help you make a better choice. The suspension is where you’ll see some compromises at this price. Front-end suspension only is fine for cross-country rides. On the plus side, it keeps the weight in check for easier handling. But you’ll notice a difference when you hit the rough terrain. Bear in mind that full-suspension bikes are going to cost you more. The 29-inch tires are part of the shift that the industry has made in recent years to improve rideability and traction from the traditional 26-inch wheels. It’s a great choice for taller folks but may be a bit high for smaller bikers. The technology has really improved with frames. An aluminum frame will provide the strength and stability you need while keeping the bike light. It’s an excellent option that keeps the MTB affordable and manageable on the road. Weight tends to fluctuate with the price point. The less expensive rides often have a steel frame and will be heavier as a result. It can also affect how the bike handles, making it harder to around tight corners. Aluminum-framed bikes like the Nashbar 29er Single Speed MTB aren’t going to be as light as carbon ones, but it’s a good compromise for a mid-range hardtail. For the casual biker, the Nashbar 29er Single Speed MTB offers a great option that has some higher quality features at a price that won’t break the bank. Its affordable price is hard to beat with a bike that brings a lot of features to the table. The Nashbar 29er Single Speed MTB handles well over rough terrain with its 29-inch tires. Its weather-proof frame won’t rust while providing a solid, rugged design. The bike is versatile for a variety of terrains and riding styles. Some components like the grips and tires are on the cheap side. Take that into consideration with your budget if you’re going to upgrade any parts. Pedals feel a bit flimsy and might be something you swap out too. There is no quick-release on the back tire. This bike is not geared for speed. We tested the Nashbar 29er Single Speed Mountain Bike to gauge its performance in a variety of conditions. Let’s take a look at the MTB in depth to see what you get for the price. The combination of a 6061 aluminum frame and a rigid chromoly steel fork provide strength while keeping the weight at a manageable level. That means a smoother ride that can handle off road biking. The 32×18 gearing is excellent for both trail riding and cross-country biking. The MTB is responsive, and the Tektro Novela mechanical disc brakes work well in any weather condition. The Nashbar 29er Single Speed MTB is an excellent value for the price. Cheaper bikes often include downgrades in the design that affect how well they handle. The Nashbar 29er keeps the cost low while providing the stability and responsiveness of more expensive models. One of the best features of the Nashbar 29er is its price. While there were some downgrades in components, the overall design bridges the gap between price and performance well. We were pleasantly surprised at how sturdy it was while coming in at less than 30 pounds. We’re a fan of 29-inch tires because of their superior stability and traction. 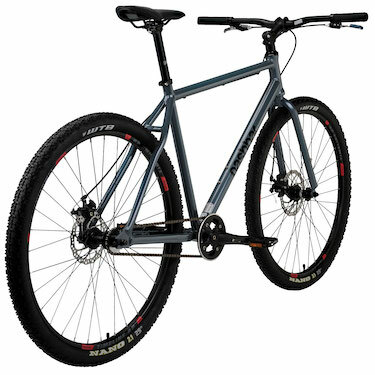 The bike includes a set of WTB Nano Sport tires for an all-purpose tire that is suited for both commuting or trail riding. They have wire bead with 27 TPI. The provide good traction even on slick surfaces. The wheels have aluminum rims to conserve on weight. The front tire is quick release, whereas the rear is not. It’s not necessarily a dealbreaker, but it may matter to some buyers. The bike comes with some so-so components that are easy to upgrade for a build that is best suited to you. And because the bike is so inexpensive, you won’t blow your budget swapping out parts to suit your kind of biking. That is an advantage that many serious bikers realize. It’s not unlike guys who build their own computers to get the exact features that they want. The Nashbar 29er gives you a good build from which to start with plenty of cash left over for other parts. With a 32×18 gear ratio, the Nashbar 29er can handle hills and muddy trail conditions like a champ. It’s not the fastest road bike, but it succeeds as a MTB. That is, after all, its primary purpose. Even though it is a mountain bike, the Nashbar 29er is suitable for other riding styles too. You can use it for commuting to work. Its solid frame can handle the extra weight of a pannier or two. It handles well in a variety of weather conditions for a reliable ride. While you may associate a single speed bike with your childhood, there are a lot of good reasons to consider it as an adult. You’ll build strength quickly hitting the trail without a geared bike. The Nashbar 29er makes it easy with a bike that is light yet strong. You’ll likely find that it will change the way you ride because you’re paying more attention to momentum than shifting gears to match the terrain. Your biking will be more active. You may even find it’s more calming when you’re paying closer attention to the trail. 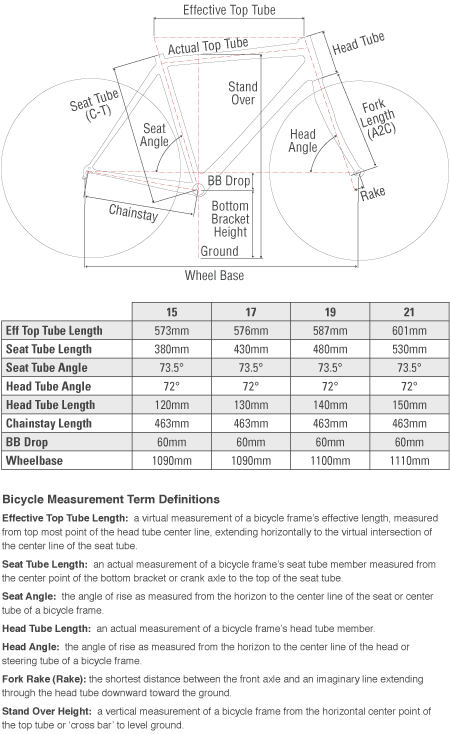 This chart will provide all the nitty-gritty details about the Nashbar 29er. 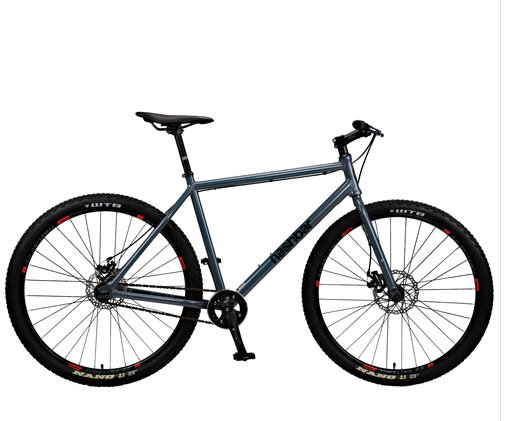 The Nashbar 29er Single Speed MTB will set you back $349.99. That’s not a bad price when you consider its solid aluminum frame, steel fork, and smooth ride. It is as well made and rugged as bikes costing twice as much or more. That’s the clearest sign of its value. 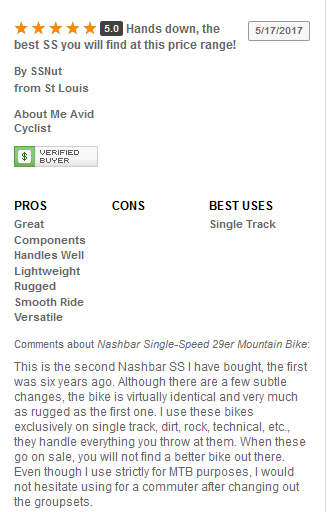 We searched the internet for customer reviews on the Nashbar 29er Single Speed MTB. The bike comes with high praise in scores of testimonials with the majority recommending it to a friend. That says a lot about the performance of a bike. Here are just a few of the ones we found. Breezer Thunder One: The 2014 Breezer Thunder One Single-Speed Mountain Bike is a serious upgrade with features such as D-shaped aluminum tubes that adds strength while distributing stress over a wider area. It is a significant jump in price and doesn’t include pedals. Click or tap here to learn more about the Breezer Thunder One. State Bicycle Co Pulsar: The State Bicycle Co Pulsar is similar to the Nashbar model but with a steel frame that adds some weight. It’s a flashy ride with black and white pulsar graphics along the frame. It includes a cable guide hardware to convert it to a geared bike. Diamondback Overdrive Comp 29er: The Diamondback Overdrive Comp 29er is a geared bike that walks a fine line with the $1,000 price point with an upgrade with Shimano components. Review Conclusion – Best Single Speed Mountain Bike? The Nashbar SS 29er is a budget-friendly bike that handles better than some of it’s higher priced competitors. So after all of that, is the Nashbar 29er the best single speed mountain bike? It certainly has a lot going for it with an affordable price and some decent features. We loved the solid construction that was still lightweight for excellent maneuverability. It performed well in our test runs. It took corners fine and handled like a pro in the sloppiest of trail conditions. It was a smooth ride on both flat roads and hilly paths through the woods. The disc brakes were reliable and stopped the bike quickly even in the rain. If you’re looking for a single speed bike, this one is hard to beat. 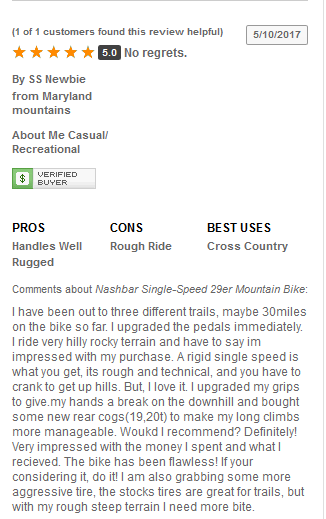 The conclusion of our Nashbar Single Speed 29er review is that yes, it is the best SS mountain bike for the money. You should definitely consider it if you’re looking for a good-quality MTB with a budget under $1,000. It stands to-to-toe with many of it’s higher priced competitors. Click Here To See The Nashbar Single Speed 29er.